Every afternoon I pass some bluebonnets on the side of the road with some cactus in the background. I have thought about this scene and wanted to try to make it work in a photograph. So, one sunny afternoon I brought my camera and pulled over to take some photos. One major problem that I had was keeping my shadow out of the shot in the late afternoon sun. I had to get down low and shoot at an angle toward the flowers. Below is one of the first pictures that I took. The problem with this photo is that there are so many flowers that there is not a focal point for the foreground. There is no real hook to get the viewer into the photo and it is kind of dull. I got down really low and tried to get a few good foreground flowers, but I did not find that one that would work. 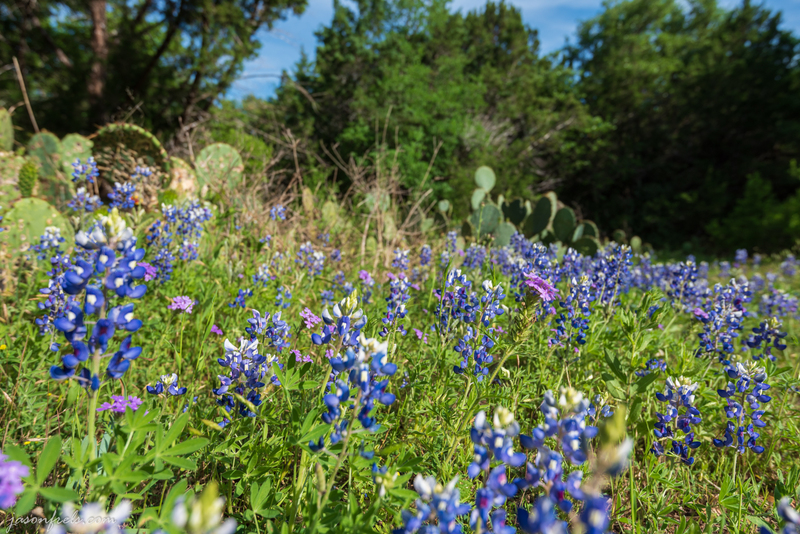 In the photo below, I tried several attempts to make the violet flower standout amidst the bluebonnets, but I don’t think that I was successful. I ended up stepping back and kind of looking down the path from the shadow of some trees and decided that I liked this composition a bit better. There is a path that gives the viewer something to follow, though the flowers don’t stand out so well. I was not satisfied that I was able to problem solve this composition and didn’t really come away with a spectacular photo. In hindsight, the last photo may have been better with a longer lens from farther back. Perhaps that would have made the flowers show up better. And maybe standing over to the left a bit to get more of the path in the photo. I returned a couple of days later when the afternoon sun was out and retook this photo with a longer lens. I stood back quite a bit farther and shot this at 65mm focal length as compared to 25mm in the previous shot. Shooting this at a normal focal length (65mm) instead of the wide focal length (25mm) resulted in much less compression of the flowers in the foreground and I think makes for a better result. Note: A normal focal length refers to focal lengths which approximate how the human eye sees the world. This is generally a range of 40mm to 65mm referenced to 35mm cameras. Focal lengths below that range are considered to be wide and above that range telephoto. 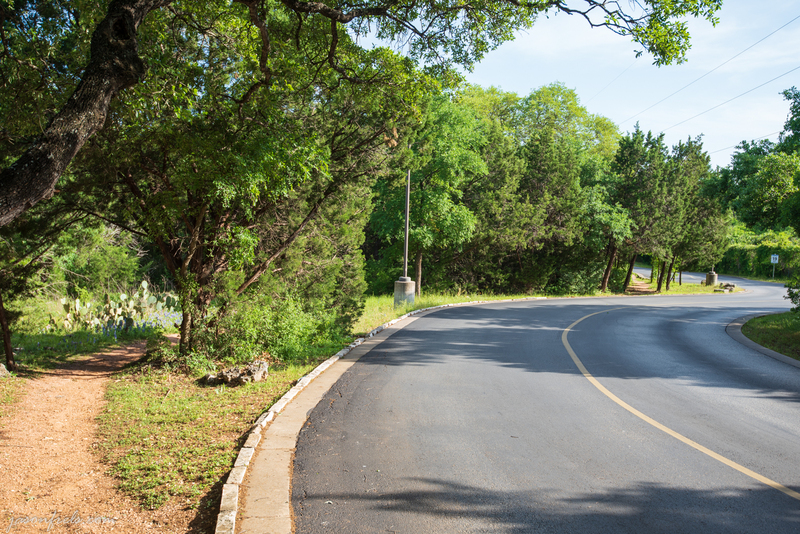 Wide focal lengths tend to make items farther away from the camera look small compared to the foreground and long focal lengths tend to make items farther away from the camera look large compared to the foreground. 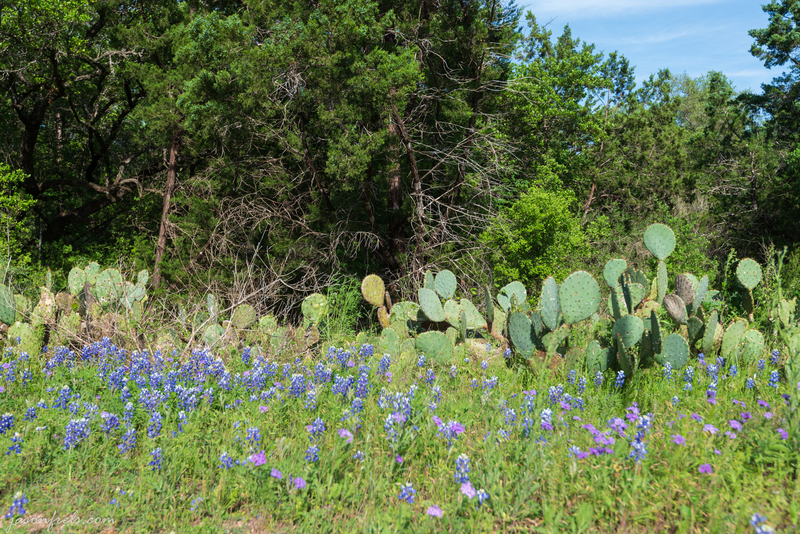 It’s a shame that the prickly pear cactus doesn’t bloom at the same time that the bluebonnets do. That may have made these better photos. Thanks for reading and leave a comment below if you like. I agree, the last one is best. But I also liked the second one, and didn’t find it dull, even though it has no focal point. Thanks, I was feeling a bit frustrated because I don’t think that I could make much out of this scene. Very nice. 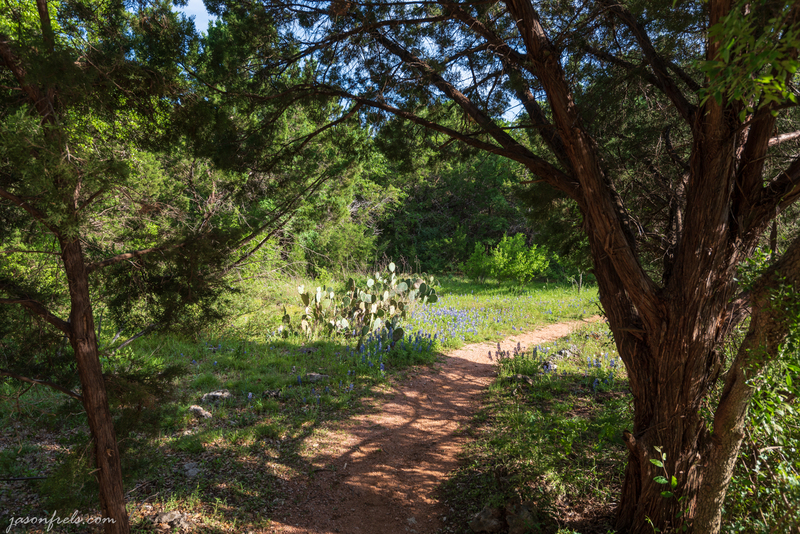 Nothing says Texas like bluebonnets, prickly pear, and cedar. 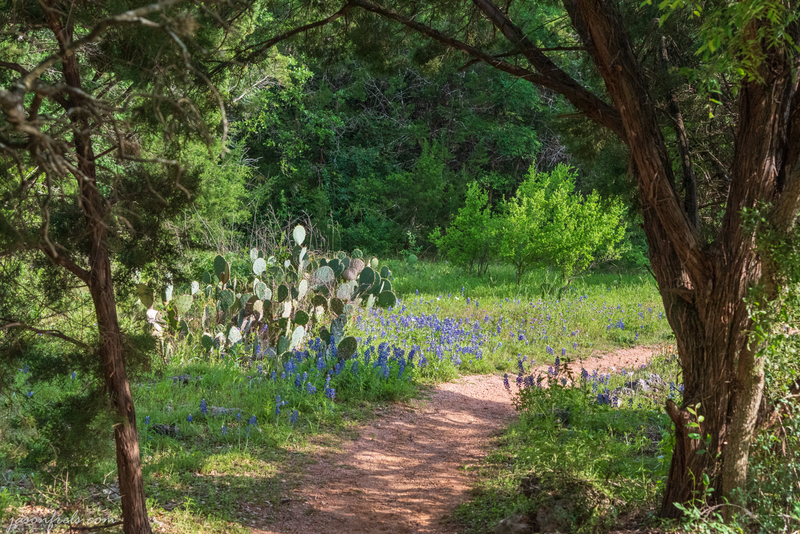 You are right–it would be pretty if the pear and bluebonnets all bloomed at the same time. Great work as usual.